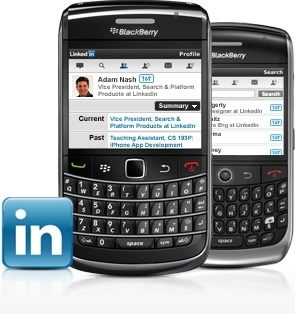 Linkedin for BlackBerry now available | BlackBerry Blast! Linkedin for BlackBerry is officially here. If you're staying connected with all of your professional colleagues and use a BlackBerry, you've probably been waiting for this app. Linkedin for BlackBerry makes the most common features available on your BB like network updates, messages, invitations and connections. Linkedin for BlackBerry can also integrate with the stock BlackBerry Calendar, Contacts and Messaging apps. Interestingly, there is no support for the BlackBerry Storm. LinkedIn for BlackBerry works with the Bold, Curve and Tour models running OS 4.3.0 and above. You can get it at the link below, or OTA.